When it comes to saving for retirement, you have big decisions to make, and the SEC wants to help. 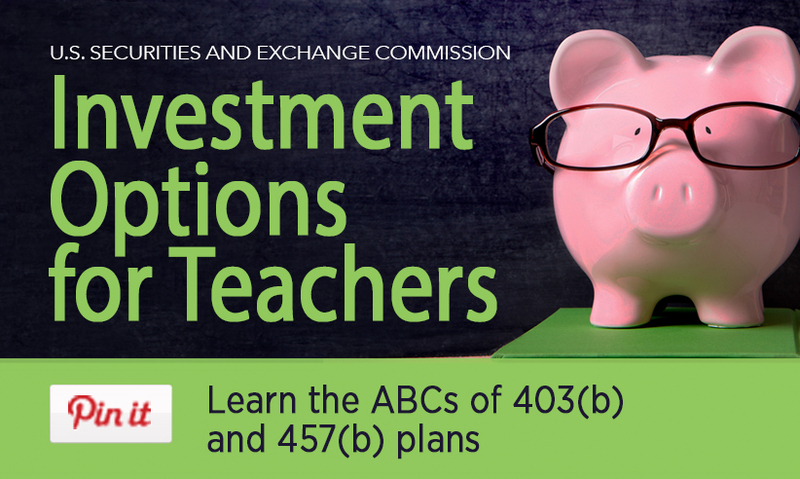 The SEC offers tools and resources to help you learn more about the 403(b) and 457(b) retirement plans that are most often offered in public school districts. You can find many that are geared just for you on this site. In addition, our San Francisco office recently launched a pilot project working with Northern California school districts. The Teacher Investment Outreach Initiative seeks to help teachers make informed decisions on investment portfolio options, fees and risk. And also how to evaluate financial professionals who offer 403(b) and 457(b) plan services. Contact sanfrancisco@sec.gov for more information. 403(b) and 457(b) plans are tax-deferred retirement savings programs provided by certain employers. Employers such as public educational institutions (public schools, colleges and universities), certain non-profits, and churches or church-related organizations may offer 403(b) plans. Employers such as state and local government agencies and certain non-profit organizations may offer 457(b) plans. Some employers may offer both 403(b) and 457(b) plans, and allow you to contribute to both plans. Contact your employer to find out if both plans are available. Similar to 401(k) plans, 403(b) and 457(b) plans allow you to contribute pre-tax money from your paycheck to your 403(b) or 457(b) plan to invest in certain investment products. These pre-tax contributions and their investment earnings will not be taxed until you withdraw the money, typically after you retire. IMPORTANT! The rules and tax consequences related to withdrawing money differ between 403(b) and 457(b) plans. For additional information on these rules and tax consequences, please consult a tax professional. You may also find general tax information about these plans on the Internal Revenue Service’s (“IRS”) website (IRS 403(b) webpage, IRS 457(b) webpage). Contributions The IRS determines the annual contribution limits for both 403(b) and 457(b) plans. In 2017, the annual contribution limit for both 403(b) and 457(b) plans is $18,000. In addition to that amount, both plans allow “catch-up contributions” of up to $6,000 for eligible participants (those age 50 or older or turning 50 that year). Each plan has specific rules governing contribution limits and “catch-up contributions.” You can review these rules on the IRS’s website (403(b) contributions, 457(b) contributions). IMPORTANT! Contribution limits for both 403(b) and 457(b) plans may change each year. Please remember to confirm the current contribution limits for each plan on the IRS’s website (403(b) contributions, 457(b) contributions). For more information, please visit Investor.gov. Read your employer’s 403(b) or 457(b) plan documents to learn the basic rules for how your plan operates. Research each vendor’s background, credentials and experience. Ask your employer to provide you with any background information it has on the vendors in your 403(b) or 457(b) plan. Some states require vendors that provide these plans to register with one or more state regulators – in addition to any required registrations under federal laws. If your state requires these vendors to register, it may provide resources to assist you in researching vendors (e.g., California and Texas). Some vendors may be registered with the SEC or state securities regulators. For tips on researching a vendor registered with the SEC or state securities regulators, please read our Investor Bulletin: Top Tips for Selecting a Financial Professional. Vendors that are insurance companies generally register with your state’s insurance commission. For information on how to research insurance companies in your state contact your state insurance commission. Understand how much you’ll pay for the vendor’s investment products and services, including any fees or commissions. Ask each vendor if it provides this information in a simple form that you can easily compare to similar information from other vendors. For more information, please visit Investor.gov. IMPORTANT! Your employer selects the vendors you may choose from for your 403(b) or 457(b) plans. Some employers only offer a single vendor. Contact your employer to find out your vendor options for your specific 403(b) and 457(b) plans. As a participant in a 403(b) or 457(b) plan, you may need to choose among different types of investments. Typically, 403(b) and 457(b) plans offer two types of investment products – annuities and mutual funds. Fixed annuity.The insurance company promises you a minimum rate of interest and a fixed amount of periodic payments. Fixed annuities are regulated by state insurance commissions. Please check with your state insurance commission about the risks and benefits of fixed annuities. Variable annuity.The insurance company allows you to direct your annuity payments to different investment options, usually mutual funds. Your payout will vary depending on how much you put in, the rate of return on your investments, and expenses. The SEC regulates variable annuities. For more information about their benefits and risks, please read our Investor Bulletin: Variable Annuities – An Introduction. Indexed annuity. This annuity combines features of securities and insurance products. The insurance company credits you with a return that is based on a stock market index, such as the Standard & Poor’s 500 Index. Indexed annuities are regulated by state insurance commissions. Please check with your state insurance commission about the risks and benefits of indexed annuities. A mutual fund is the common name for an open-end investment company. Like other types of investment companies, mutual funds pool money from investors and invests the money in stocks, bonds, short-term debt or money market instruments, or other securities. Mutual funds issue redeemable shares that investors buy directly from the fund or through a broker for the fund. For more information about annuities and mutual funds, please read our descriptions on Investor.gov. [+]What fees will I pay? Fees and expenses vary from investment product to investment product — and they can take a huge bite out of your returns. An investment product with high costs must perform better than a low-cost investment product to generate the same returns for you. Even small differences in fees can mean large differences in returns over time. If a vendor tells you an investment product has “no fees,” it may mean there are no upfront fees when buying the investment product. But most investment products in 403(b) and 457(b) plans have expenses related to their operation that come out of their investment returns on an ongoing basis (e.g., an expense ratio for mutual funds or administrative expenses for annuities). These ongoing expenses can have a major impact on the investment product’s overall investment return. For mutual funds and variable annuities, you can find information on costs and fees in the prospectuses. For fixed annuities, check the sales literature or the contract. If you need additional help understanding mutual fund related fees, please read our Investor Bulletin: Mutual Fund Fee Expenses. If you need additional help understanding variable annuity fees, please read our Investor Bulletin: Variable Annuities – An Introduction. In addition to investment product fees, you should also carefully consider the impact of vendor fees. You can generally find these fees in the vendor’s plan materials. For additional information on how fees can impact your investment returns, read our Investor Bulletin: How Fees and Expenses Affect Your Investment Portfolio. Do you know your Retirement Plan Options? Signup for news about this topic. The SEC offers a digital toolkit on this topic? And has even more information available on Investor.gov?